Who doesn’t like a one-pot, easy, good-for-you, veggie-filled, creamy pasta sauce? Did I mention that it’s also freezable? Meet one of my staples, this Easy, 5-Ingredient Creamy Carrot Tomato Vegan Pasta Sauce! I’ve been making this sauce for quite some time now. I usually have some in my freezer, and therefore makes the perfect quick weeknight dinner, school lunch, or “I’m feeling too lazy to cook” meal. Just boil your favorite pasta, defrost this vegan pasta sauce, and there you have it…a delicious easy meal! Why Is This Creamy Pasta Recipe So Awesome? 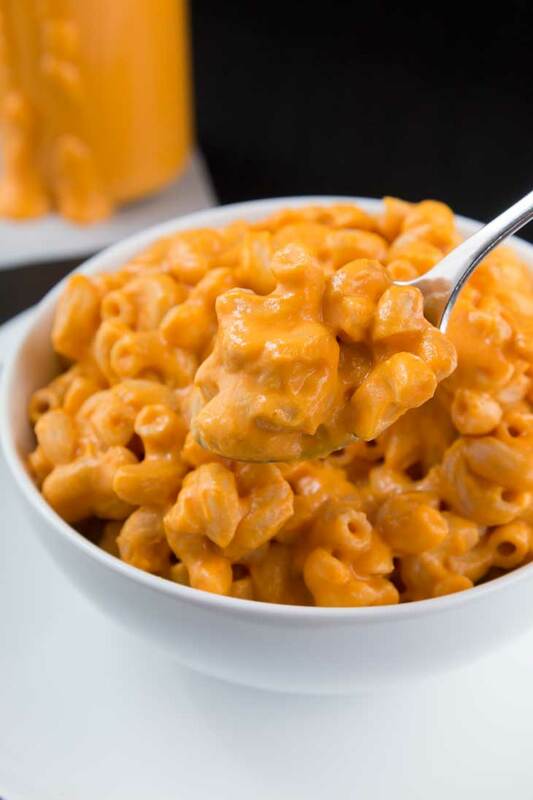 It’s vegan, gluten-free, made easily in a pressure cooker or instant pot (stove-top directions also included), freezable, only 5-ingredients, hearty, and contains veggies (for those picky eaters). Use your favorite quinoa or lentil-based pasta for some added protein. This recipe started off as a quick way to use the 60+ vine-ripe tomatoes in our yard after my kids and I came back from a week-long road trip. My husband had to work and stayed back, but warned me about all the fresh produce grown in our yard (this was also when we had four 2-3 lb. zucchinis growing in our yard!). When we’re home, especially during tomato season, it’s easy to use them up as they ripen. They literally taste like candy. 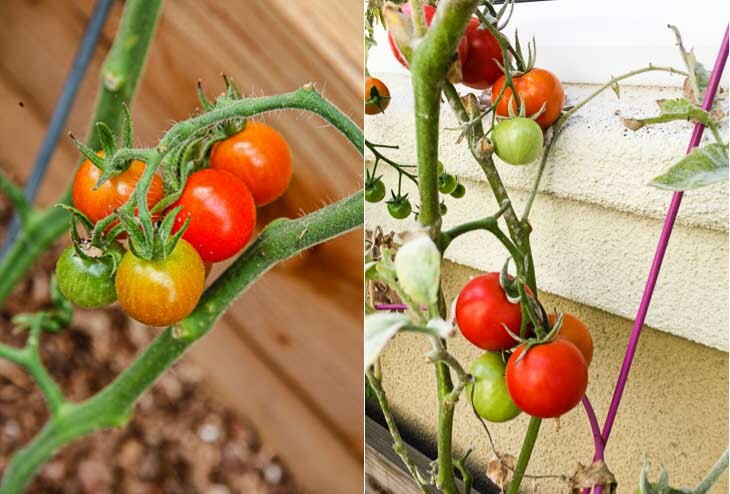 The kids can easily polish off 10-15 cherry tomatoes while playing in the yard. I don’t know about you guys, but it always takes me a day or two to get back into cooking after we come home from vacation. In other words, I was lazy, yet had a boatload of tomatoes ready to be used. Instead of making my standard easy Spicy Tomato Sauce, I felt like throwing all the tomatoes into one pot and being done. Little did I know that my easy quick pasta sauce would not only become a staple in my house, but also a favorite that we now use for a variety of different dishes! Only 5-Ingredients To Make This Easy Pasta Sauce! The simple combination of homegrown tomatoes and cooked carrots (bringing out their natural sweetness) made this sauce thick and creamy. But why stop there? If you’re not allergic to nuts, blend in some soaked cashews to make this vegan pasta sauce richer & super-creamy!! But to all my nut-free readers out there, the cashews are totally optional and this sauce will still taste great. Can you believe that I really didn’t edit these pictures that much? Yes…the color of the sauce is really that vibrant! Chop the carrots and tomatoes into large pieces. Mince the garlic. In your pressure cooker or instant pot, quickly saute the garlic and onions for a few minutes. Add in the carrots, a little salt, and some water. Pressure cook. Open to cool. Blend completely in a Vitamix with the drained soaked cashews (if using). Reduce the sauce to thicken if necessary. Season well with salt and pepper! I always make a large batch of the sauce so I can freeze the leftovers in my freezable deli containers for a quick meal when I need it. 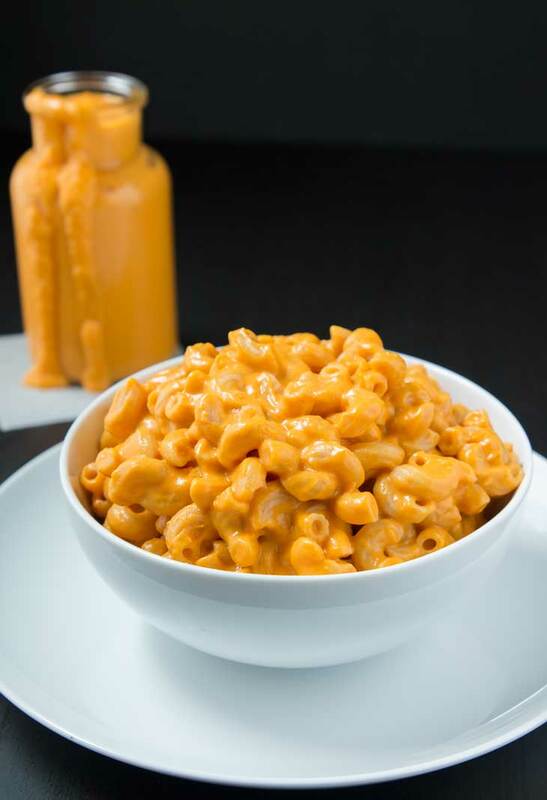 My kids refer to it as vegan mac n cheese, but it’s more of a delicious veggie filled smooth sauce that can be used for a variety of different dishes. Baked Pasta Dish – Toss with cooked pasta, layer in a baking dish, top with vegan mozzarella and/or seasoned breadcrumbs, and broil in oven for a few minutes. Pizza – This makes the perfect creamy pizza sauce, complete with veggies! Spiralized Veggie Dish – Spiralize some zucchini & add in any other veggies (broccoli or mushrooms). Cook the veggies on high, add in the spiralized zucchini for a few minutes, then toss with vegan pasta sauce. Add some red crushed peppers or vegan parm. Baked Spaghetti Squash Casserole – Toss this vegan pasta sauce with roasted cooked spaghetti squash. Place in casserole dish, top with vegan mozzarella or breadcrumbs and bake in the oven. 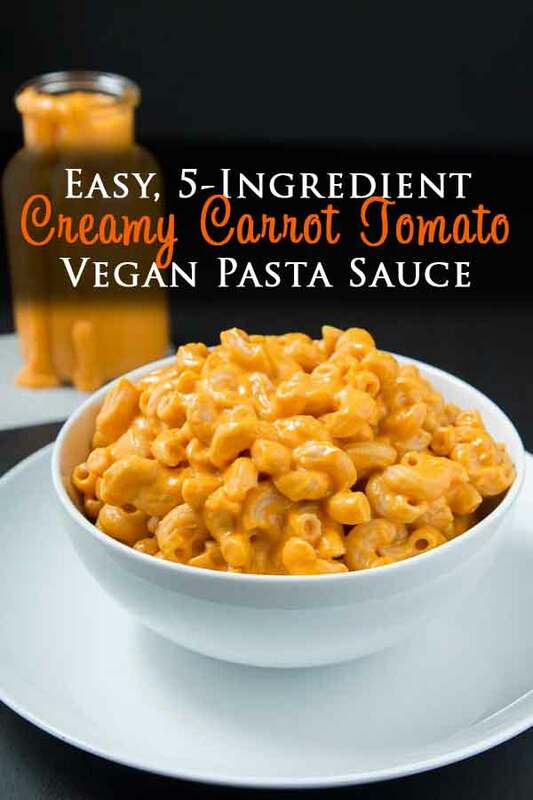 This rich Creamy Carrot Tomato Vegan Pasta Sauce is only 5 ingredients, loaded with hidden veggies, freezable, easy to make, and can be used for all sorts of dishes! Select the Saute button (normal) on the Instant Pot or heat a non-stick pan on medium heat. Add all the minced garlic and cook until fragrant (~30 sec). Add the diced white onions and cook for another 1-2 minutes, stirring frequently. Add the diced carrots, tomatoes, and celery (if using). Saute for another 1-2 minutes, stirring frequently. For Instant Pot Method: Close the Instant Pot lid. Select the Pressure Cook button to cook on high pressure (HP). Set the timer for 7 minutes. When the time is up, allow the pressure to release naturally (NPR). Open the lid and cool slightly. For Stove-Top Method: When mixture starts boiling, turn down heat to gentle simmer and cover pot. Let it simmer covered for about 15 minutes or until carrots are very tender (no need to add water to the pot because tomatoes should release liquid). Empty the contents into a blender (I used my Vitamix) and completely puree everything. Depending on how much sauce you make, you may need to do this in two batches. Pour most of the pureed sauce back into the pot or instant pot, but leave about 2 cup of the sauce in the blender. Drain the soaked cashews (if using) and add them into the blender with the remaining sauce. Blend on high completely until the cashews are pureed and the mixture becomes thick and creamy. There should not be any pieces of cashews left in the sauce. Pour the cashew cream/pasta sauce mixture in the pot along with the rest of the pasta sauce. Heat the pot on medium-low, saute mode (normal) for Instant Pot, and simmer uncovered for 5-10 minutes to reduce and thicken the sauce if necessary. Season with salt to taste. Since we did not add any salt prior to this step, depending on how sweet your tomatoes are and whether or not you used cashews, you may need to add a decent amount of salt for the amount of pasta sauce you have. (optional) Add red crushed pepper and freshly ground black pepper for some spice. The creamy carrot tomato sauce is done! You can pour it over your favorite cooked pasta, use it as a pizza sauce, in a casserole, or let it cool completely and freeze in freezable containers to use at a later time (see notes below on how best to defrost). This recipe makes about 3 cups of sauce. you need 6-7 tbsp sauce per 1 cup cooked pasta. The nutritional label below includes the use of cashews. Follow through with recipe up to Step 6. Lock the lid in place for the pressure cooker (make sure you have the whistle attached) and turn the heat to medium-high. Once the steam begins to hiss out of the pressure cooker, reduce the heat down to medium to maintain the hissing. Cook for an additional 5-10 minutes. Turn off the heat and let the pressure cooker sit until the safety valve releases and you can open the pressure cooker. Follow the above recipe again starting at Step 9 until the end. Just add a bit of water if needed while blending to get desired thickness of sauce. 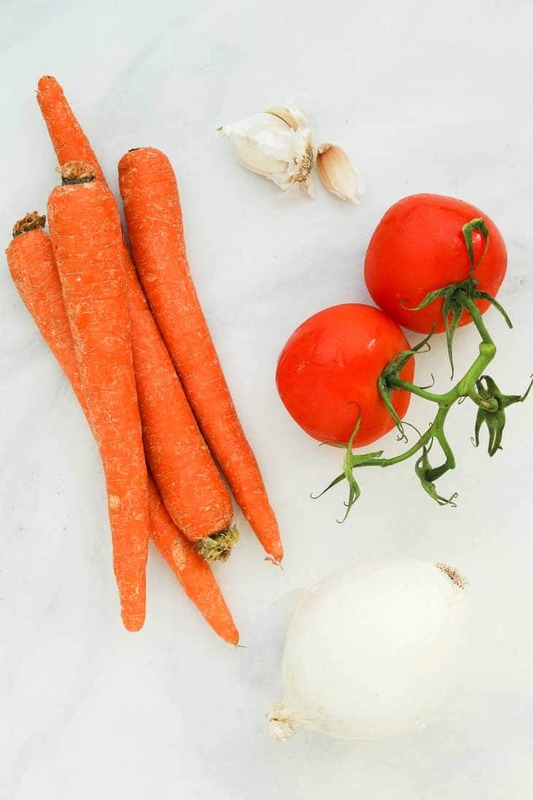 Seasoning/Tomatoes/Carrots - The tomatoes I used were home-grown and sweet, so depending on how sweet your tomatoes are will affect the taste of your sauce, so feel free to adjust accordingly with enough salt. The instant pot/pressure cooker method allows the carrots to really cook through and caramelize. Freezing Option - I typically make a larger batch of this sauce and freeze leftovers in freezable containers for quick go-to meals. Simply pull the sauce out of the freezer the day before to defrost, and give it a quick whirl in any blender to fix consistency before heating (I use my hand blender). For the Pasta - I recommend using any of the following: NOW Foods Quinoa Pasta, Whole Grain elbow pasta , Explore Cuisine Red Lentil Penne, or Explore Cuisine Green Lentil Pasta (the last two options are both Gluten-Free and have 21g of protein per serving for a complete meal! ), gluten-free brown rice pasta by Tinkyada, quinoa pasta, etc. To Prepare a Baked Pasta Dish - For every 1 cup cooked pasta, you'll need about 7 tbsp of the creamy carrot tomato sauce. Mix, add in fresh black pepper or red crushed pepper for spice and heat, then transfer to a baking dish. In a separate bowl, combine 2 1/2 cups breadcrumbs, 1 1/4 teasp salt, 1/2 teasp onion powder, 3/4 teasp garlic powder, and 3/4 teasp dry Italian Seasoning. Sprinkle a layer of your favorite vegan mozzarella (follow your heart block or Daiya new cutting board collection are two of my favorites). Sprinkle a thin layer of the breadcrumb mixture over the pasta (store leftovers in an air-tight container in the fridge), and broil in the oven until golden brown (this will happen quickly so be sure to watch the oven, otherwise your breadcrumbs will burn). You can also bake this dish at 375 degrees if your pasta is cold, but be sure to slightly under-cook your pasta and add a little more sauce so it does not dry out while baking. Pizza - This makes the perfect creamy pizza sauce, complete with veggies! Spiralized Veggie Dish - Spiralize some zucchini & add in any other veggies (broccoli or mushrooms). Cook the veggies on high, add in the spiralized zucchini for a few minutes, then toss with vegan pasta sauce. Add some red crushed peppers or vegan parm. Baked Spaghetti Squash Casserole - Toss this vegan pasta sauce with roasted cooked spaghetti squash. Place in casserole dish, top with vegan mozzarella or breadcrumbs and bake in the oven. Thank you! Can you believe I didn't have to edit these pictures?? That is the natural color from the tomatoes and carrots...love it! The spoon one always makes me think twice about taking a bite from my computer ha! Thanks again Reshana! Is there anyway to adjust this recipe to a slow cooker? It looks delicious but I don't have a pressure cooker. I honestly have never used a slow cooker, but from what little I know about them, yes, you should easily be able to use a slow cooker for the recipe just like you would make any sauce in there. 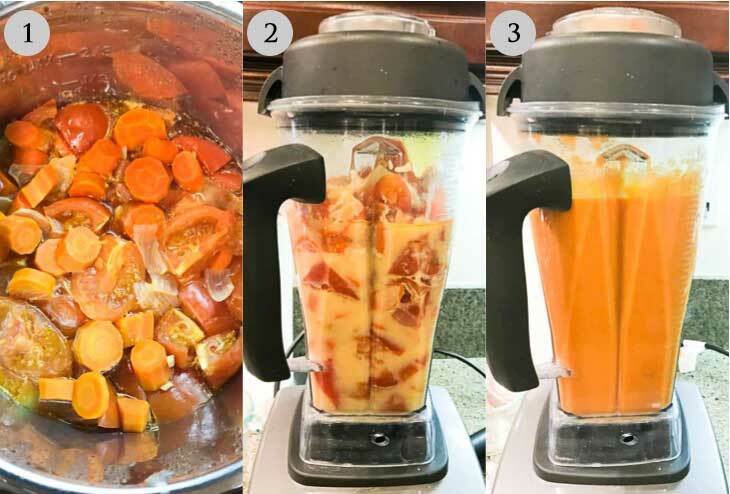 I know for the pressure cooker, the more the carrots cook, it allows them to caramelize and brings out their sweetness which is what I love about this sauce. A slow cooker should do the same. Perhaps saute the onions and garlic, then add them to the slow cooker with carrots and tomatoes and enough water necessary to cook. Once everything is cooked, puree and reduce the sauce to the right consistency over the stove? Should work great! Let me know if you try it! So I only made the sauce to freeze...I sautéed the garlic and onions and then threw it in the instapot for ten minutes. When I put it back on the stove we needed a bit more salt and some sugar. But overall it is really good! And omg, the color is so amazing!! Really made me want to eat it right away! Perfect!! I do not add very much salt, so you'll definitly need to add more salt in the end to taste. I actually just modified the recipe to include more carrots which really bring out the sweetness of the sauce eliminating the need for any sugar. Glad you liked it! I make a huge batch to freeze, but honestly we usually eat it two days in a row, which doesn't leave me with much to freeze ha! Thanks for trying it out! Yes of course...just needs to cook to be blend-able as you said. Is there an alternative to use for the cashews( we are allergic) to make it creamy? If so how much? This recipe is all about using the pressure cooker to bring that creamy sweetness out of the carrots. I developed this recipe without the use of cashews (which is why it's actually listed as optional in the recipe), and it's still nice and creamy in texture and taste. 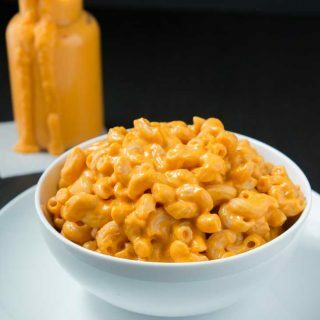 The addition of cashews enhances it a little more, but even without it this sauce tastes delicious and still has a great element of creaminess to it. So my recommendation would be to simply omit the cashews! But if you want to add something else, you can try a small gold yukon potato, or some cannellini beans. Both of these are mild in flavor and will add a little thickness to the sauce, although just so you know, I haven't tried these additions myself in this particular dish. Hope that helps! You'll love it either way...let me know how it turns out if you make it! Thank you for this amazing and fulfilling recipe! I ended up making this recipe in a regular cooking pot because I don't own a pressure cooker, and I must say it turned out delicious, and the veggies maintained their sweetness and creaminess! I followed through with the recipe up to step 6, and when the mixture started boiling I turned down the heat and covered the pot. I left them simmering for about 15 minutes, until the carrots were very tender. I did not need to add water to the pot because the tomatoes were releasing their liquids. I just added a bit of water while blending the veggies to loosen up the sauce a little. It worked out great! Thank you so much Nayla for the comment and for posting a picture of your dish on IG (which i'll be sharing soon!). This is one of our staples in our house, especially since you can make a huge batch and freeze the sauce for quick meals. I've only ever made this in a pressure cooker but have gotten questions on whether this can be made without one and so thank you for trying it out and commenting so others know! It's great to know that the carrots still caramelize and sweeten up cooked over the stove. Thanks for trying out the recipe and following! This sauce turned out to be the most delicious one I have ever made! I skipped the cashews, just made the sauce and had it tossed with pasta, IT. WAS. YUM. A big thank you for this super simple yet hugely flavorful recipe! So awesome to hear Meera!! Thanks so much for the great review and trying it out. 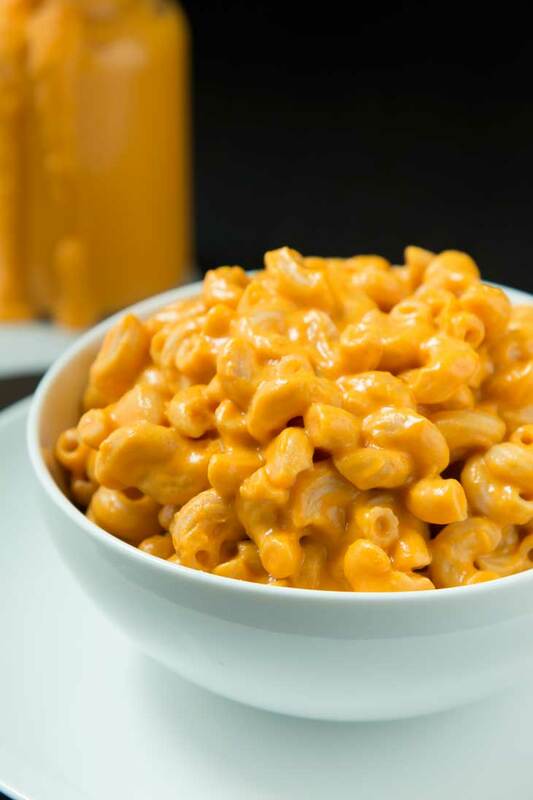 I initially developed the sauce without the cashews (wanted a nut-free option), but have since then been adding the cashews in for that extra creaminess. But you're right...it's delicious without it as well! Glad you loved it and thanks for the comment. I was looking for a pasta sauce recipe to try with my new Instant Pot pressure cooker. This turned out great. I added some butternut squash as well and my toddler and twins loved it! Super easy and a great way to add in veggies to the meal. Thanks so much Rakhee! Awesome to hear that you made it in your new instant pot pressure cooker! I've been wondering how those things are. The butternut squash sounds like a great addition! Thanks Reena! I've gone back and forth on whether to buy an instant pot, but decided against it because i grew up using a pressure cooker. If I understand properly, an instant pot is basically an automatic pressure cooker? Since I'm pretty much home all day, it's easy for me to watch the pressure cooker...but i totally could see how it saves time and effort if you want to set it and go. Not to mention, you don't have to figure out the ideal time to cook in the pressure cooker since it's automated in an instant pot =) So I thought maybe I wouldn't get another one. But let me know if i'm mistaken! I'm always curious to hear people's opinions on it =)And THANK YOU so much for trying out ths recipe...so glad you and your kids love it! Seems like you use it just as much as we do =) The butternut squash would be great....just a little sweeter! You can also freeze this sauce btw...just have to blend quickly to fix the consistency after defrosting. I do this all the time. Thanks so much for your comment and trying it out! For those of you who made this in an instant pot can you tell me whether to use type pressure in how many minutes cooked and whether you did it quickly base when it was time or let it do the slow release? I'm not sure if anyone has used an instant pot, but you can totally use it since it's basically an automatic pressure cooker. I would just look up the settings to steam carrots and you should be good to go! Basically just saute everything in there, cook as you would if you were simply steaming carrots, and slow release. Let me know how it goes! It's pretty basic and you should be fine as long as the carrots are cooked through prior to blending. Carrots tomatoes pasta sauce was excellent. We loved it. Yummy as well as healthy! Best thing is there were not so many ingredients needed. All were in my fridge :) Will surely try this again. Thanks!! Oh awesome! So glad to hear...did you make it in a pressure cooker or stove-top? Next time make a huge batch and try freezing it for a quick meal later! thanks so much for the great review! This looks amazing - I've always enjoyed carrots in marinara sauce but hadn't seen a pressure cooker recipe! I'll be trying this in the near future. Thank you! thank you! You'll love this sauce. I make a huge batch of it at once and freeze for quick meals or school lunches. If you're not allergic to nuts, be sure to add in the cashews for a creamier sauce!